CMS iRecruit is offering an exclusive discount to customers of Sage Abra eRecruiter who are looking to upgrade. Sage announced this week that their recruiting product Abra eRecruiter will no longer be supported after September 2014 (Read More). iRecruit has supported Sage HRMS integration since 2005, and offers the best available integration to that product. 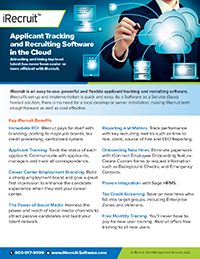 To find out more information about iRecruit and our exclusive offer for Sage Abra eRecruiter customers, please call 800-517-9099, sign up for a demo, or view our brochure(PDF). This entry was posted in Blog, iRecruit Blog and tagged abra erecruiter, iRecruit, recruiting solution, sage hrms, upgrade. Bookmark the permalink.